The Organic Geochemistry Lab at the University of Washington is a shared facility operated jointly by Rick Keil, Anitra Ingalls and Julian Sachs. . The lab is divided into multiple working spaces, and includes a 2500+ sq ft 14C-clean space. 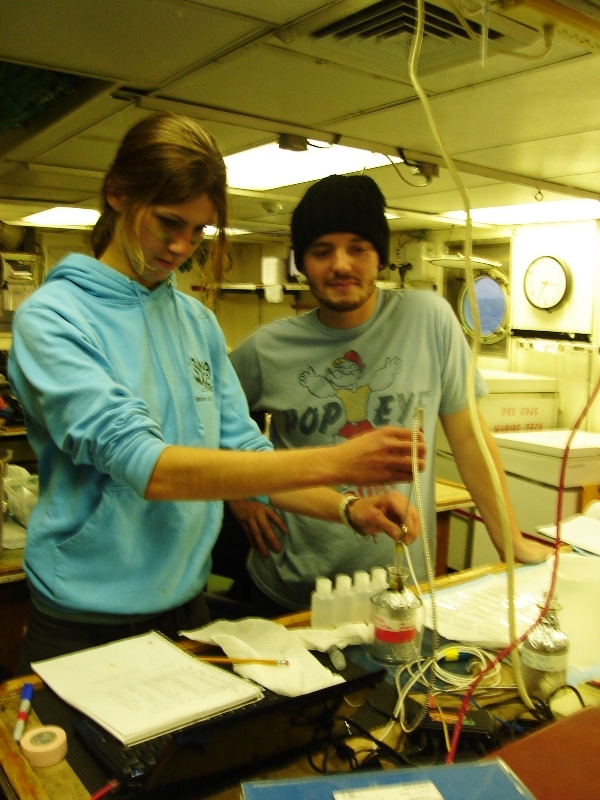 There are also two common labs for non-14C critical work, in which Jeff Richey and Keil maintain a GC-FID/ECD for methane and gas analyses and other miscellaneous laboratory instrumentation. Shared analytical equipment in the organic geochemistry lab includes five LC/MS units (a quad, an ion trap, two triple quads and a Q-TOF) and two GC/MS units (an Agilent quad and a Leco TOF). Appropriate drying, extracting, rotovap’ing, sieving, centrifuging equipment, etc. is maintained. We have a CEM microwave digestion system for organic matter digestion using CuOxide (lignin) and hydrochloric acid (protein hydrolysis for amino acid analysis) and microwave-assisted enzymatic digestion (proteomics and peptide mapping). There are two Shimadzu HPLC systems, one dedicated to amino acids (OPA derivatization) and the other to organic acids. Mineral surface area measurements are made on a Micromeritics ASAP 2001 Chemisorption Station. The laboratory also contains two glove boxes, one for core slicing and one for sediment incubations and microbial degradation studies, a super-speed refrigerated centrifuge, a laminar-flow hood, ultrafiltration systems, an epifluorescence microscope and a variety of spectrometers and general laboratory supplies. The lab also contains a fully outfitted walk-in cold room with flowing water, electricity and computer data ports. We have previously set up long term incubation studies up in this lab, which is held currently at 8ºC.